Think of the Akashic Records as a Library where there are billions of soul books that line the shelves. Your soul book is one of them. In your soul book, we are able to view everything that you’re experiencing in your life, see where it started, why it’s occurring and how to shift it… if necessary. I teach people how to access their own Akashic Records to receive guidance, healing and answers whenever they’d like. It’s easy. I left a high paying corporate job one day, with no plan for the future. I was so burnt out, I slept for months… When I finally decided to make a change in my life and do things differently, doors swung open for me in ways that I couldn’t even fathom. I was invited to attend an event where the host led us through a meditation and this is where I first heard and spoke with Archangel Michael. Within 4 months, Michael led me to the Akashic Records. The Akashic Records changed my life. They taught me how to locate what was holding me back in life and shift it. And it's not difficult! I’m showing you everything I’ve learned so you can do this for yourself. If I did it, so can you. To be honest – there’s one thing that must be done to ensure you are receiving the most accurate intuitive information for yourself and for others. This is not about control! It's about the opposite of control: POWER. Control is a fear based energy that implies that you need to do something or hold on tightly in order to get the outcomes that you want, whether it's a relationship, more clients or more money. Power is stepping into your life with the faith that everything is working FOR you. This is a very different energy that's based 100% in faith and confidence, not fear. The more that you discover what makes you tick, from the inside out, the more you begin to trust that things are working out for you. We need to understand WHY things are happening in our lives in order to move past them. That's the first step. Wouldn't it be great if you could just ask an Angel why something has occurred in your life? And hear the answer? It’s not like hearing Angels or even the Akashic Records is some magical gift. We all have this ability! In this course, i'm teaching you how to hear and how to take action in your life. Not any action, but action that is aligned with your soul. When you consider the long term costs of consulting other healers and psychics to answer your most important questions, this investment is so minimal - plus, I have a great payment plan and a 30 day money back guarantee. This is the last time i'll be offering ARI this year and it's a self guided course. Feel free to register and log on at anytime to begin your training. Best part? Register now and you're in it for life. Every time I release a new version, you're automatically IN. I'm one of the very few spiritual teachers that has a 100% success rate. All of the graduates of the ARI program are successfully accessing the Akashic Records. I am committed to your success. That is FANTASTIC! About half of the graduates of the ARI program were already connected with their intuition and they took the course to enhance their spiritual tool belt. — Jessica Ehrenworth, M.A., R.P. Felicia’s Akashic Record course has been nothing but mind blowing and opening. I’m now able to delete ALL my blocks, limited beliefs and anything in the way of my true sparkle. The fact that I have the ability to HEAL my WHOLE self and learn in a safe, loving compassionate environment is nothing but amazing. If any of you were on the fence with taking part in this program, and are a huge fan of self healing and helping others, definitely get yourself signed up the next time she offers this course! I’m a reiki master teacher, holistic health coach, yoga teacher and psychic and THIS tool, the Akashic Records has been my favorite modality YET. The Akashic Records Intensive is a self guided program with live group calls that helps you fully plug into your intuition by teaching you a proven process that I've personally used in hundreds of client sessions for the last 2.5 years. To set you up for success, you'll receive an Akashic Records Attunement prior to the course. This includes an energy upgrade to assist you in accessing the records, plus a lift in your vibration to assist with integration and processing. You'll learn my 4-step clearing process and hit the ground running by deleting and replacing energy. This process has helped hundreds of people in the last two years and continues to make a huge impact in lives all over the world. The Akashic Records Intensive is a self guided course with some live components. You have complete access to the entire Akashic Records Program beginning October 17, 2016. This is a self-guided, go at your own pace course. There are two (60 minute) calls included with this program, one per month. If you are unable to make it live, the calls will be recorded and uploaded to your account. (6) Live Group Call Recordings. Over $1200 in Bonuses - yours FREE. 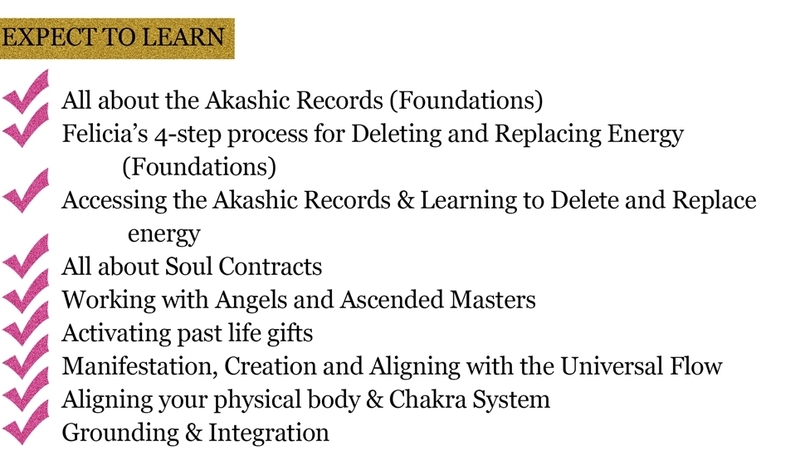 The Full Akashic Records Intensive Training Course & Certification (Level 1). This includes access to all of the Akashic Records module content (with downloadable worksheets, the attunement and audio files). Once your assignments have been turned in, you'll receive certification verifying that you've successfully completed all the requirements. - Value $1997. The total value is $4, 235, but I'm offering all of it for the low price of $697, through Monday Nov. 28 only. Upon payment, you'll receive Module 0, a course on How to Muscle Test Like a Badass. The next module will be published 6 days later and the next three modules will be released bi-weekly thereafter. The bonuses and ARI live Calls will be released after 30 days. I have a 30-Day 100% Satisfaction Guarantee. Because ARI is a self guided course that requires your active participation and practice, we typically do not offer refunds after a purchase is made. If you have completed all of the assignments and practiced and still feel like you didn't get 10X the value from this training material, we will consider a refund within 30 days (beginning November 28, 2016), but only if you have worked with our support staff to try and resolve the problem first and have completed and turned in your divine assignments. Email the ARI support team to resolve the issue (info@feliciamarieg.com) before the 31st day, and we'll be happy to work with you. Terms, Payment and Cancellation Policy: Clients that choose to make payments will be invoiced according to the payment schedule that they sign up for (through Stripe or their bank). If a payment is missed and/or declined, your place in the program will be suspended until the account is reconciled. Felicia believes whole-heartedly in flexibility, communication and correcting issues if they arise. She would prefer hearing from you if there is a problem with the payment. If she does not, she reserves the right to take the necessary corrective action to bring the account current. You may think that you don't need healing right now, or that the timing isn't right, but how many times have you allowed Fear of Change or Procrastination stop you in the past? The Universe responds to people that take consistent guided action and co-create the reality that they wish to be living in. It's never too late to make yourself a priority and change your life, right now. The first step is always the most difficult, but it's also the most rewarding.